Receptionist: Yes, sir. How can I assist? 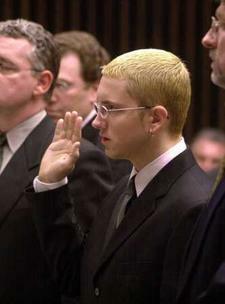 Eminem: Wanna see what I do when I run out of pills? Where’s my momma, huh? Cuz my sheets are in a heap. Don’t you run your mouth, what kinda place is, this? God! Now, can I picture Britney Spears or maybe Betty Rubble?